While driving your tire may run over a nail. This can lead to the air escaping from the tire, eventually leading to a flat. But, if you bring the tire to a mechanic they can easily insert a plug and the air stays sealed in allowing you to drive. Platelets are the body’s version of that tire plug but if we do not have enough of them – or we have a low platelet count normal blood clotting cannot occur our body can’t get “plugged.” The medical terms for this is thrombocytopenia. Platelets or thrombocytes are blood cells which help with blood clotting. An average healthy person will have between150,000 to 400,000 platelets. 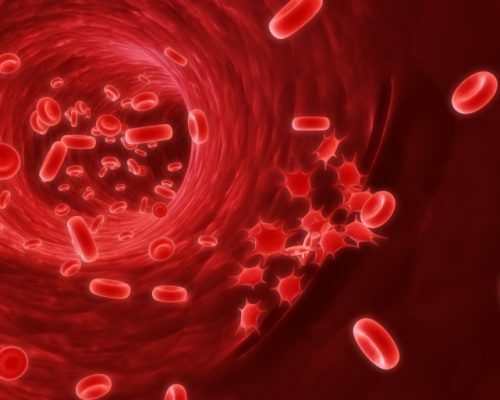 When healthy these blood cells clump together to fix holes in the blood vessels, but if the platelet counts are low, they body has a harder time making these repairs. This can lead to bruising or bleeding which can be quite serious. Thrombocytopenia is a condition which platelet levels are low. Common causes of thrombocytopenia include immune system disorders, chemotherapy, radiation, leukemia, or a side effect to medication. Thrombocytopenia can be mild and manageable or it can get quite severe leading to internal bleeding. If you’re concerned about your platelet count, there are a few things you can do on your own to boost their production. Eating fruits and vegetables that are high in antioxidants is a good means to boost your platelet count. Some of these foods include spinach, beets, papaya, guava and tomatoes. On the other hand you should avoid items which contain aspartame, quinine (found in bitter lemon and tonic water) and alcohol. These items can worsen your condition. Restricting calories has also been shown to improve platelet count. In the 1994 and 2011 studies on calorie-restricting and platelet counts, researchers found limiting calories, by even 32 percent, was enough to extend the lifespan of the platelets and slow down aging. Generally consuming a balanced diet which ensures you receive all essential minerals and vitamins is best to promote platelet counts. Getting these nutrients from food will ensure you’re not overdosing on unnecessary amounts of these nutrients. If you’re unsure if your mineral and vitamin counts may be low, blood work can confirm your levels for you. Another factors to keep in mind if you have thrombocytopenia is to try and avoid injury. Bleeding may not be able to stop so you may want to check with your doctor about what sort of activities are safe for you. Lastly, be mindful of over the counter medications. Although generally safe, some pain-relievers can impair platelet function.